Any good fortification map tile mods? Status: offline I've always found the default "circle" fortification graphic a bit "lacking". These are the two entires in "h_tiles_misc.png". 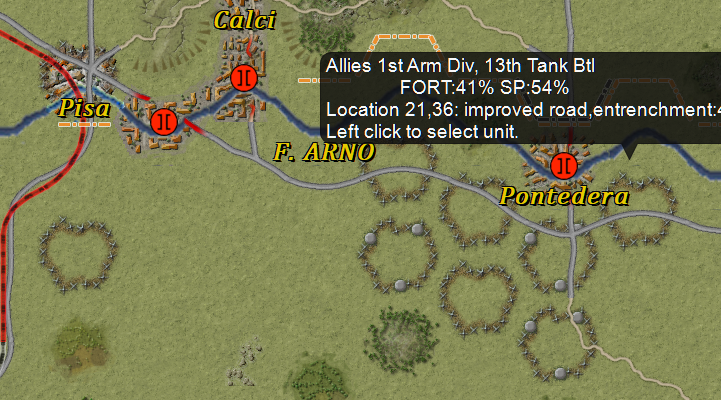 What I'd love to have is something showing ala actual trenches or fortifications, or even something similar to the "fortified line" tiles (h_tiles_fortifiedline) would look a lot better. My graphic skills are not really good enough to create something from scratch. Does anyone have any suggestions or would be willing to try create something? EDIT; fortifications, not entrenchment, for clarification. Status: offline I think the circle is great for a simple reason: it's symmetric and symbolic. The problem is that you only have a single hex option for fortification, not a whole set of tiles, as is the case for fortified line. If you try to make a more "organic" shape, it will be asymmetric and the shape will repeat itself all around creating a strange unnatural pattern. As a circle, it repeats itself already in a brick like pattern, but at least it is explicitly symbolic. Status: offline Thanks for the reply Cabido. Yes, I understand that using "trenches" would probably not work, as well as being mostly illegible on most map tiles. It needs to stand out, and like you said it's symbolic. For your (awesome) map mod it would work fine as it goes for a board game look. On the more realistic default tiles it looks out of place to me. Using the central star as a template I was able to create something like this, which is better (more fortress-like) but still not satisfied with how it looks. Status: offline It's not a bad shape. I just think it seems more robust than the original fortified line. Also, try to place it all around and see how it will look after zooming out. I have tried some shapes that have created some unpleasant patterns when zoomed out. Remember that a lot of those things will be on the map during a game. This one may create some flowery pattern when zoomed out. Status: offline Yeah, I just thought it looked more "aggressive" which I liked. But when zoomed out it doesn't really improve on the original, and also looks bad when a lot of them are clustered together - like the original. If you try to make the s_tiles_misc follow the same 1.44 AR it results in glitches when zoomed out. I'm sure you've encountered this in your modding too? 2. Have you found what the best interpolation method for resizing to smaller, and still keeping it crisp? I use the Gimp. "Cubic" is the standard I think, but makes things washed out. "None" makes things crisper but also causes artifacts on some icons. Status: offline 1. Yes, it doesn't follow the same aspect ratio. You'll have to change it. Just scale to the 270x192 resolution. 2. I have already recommended GIMP in this forum, but I use Photoshop. I used to work with computer graphics and I still have an older version of it. For the mod, I used the bicubic sharper (photoshop has 3 bicubic interpolation methods). Nearest neighbor tends to present sharp results, but usually causes jagged edges. I would have to open GIMP (it's installed on another computer) to remember the methods available. Anyway, if you can't find a decent method, send me the files and I'll try to scale them in Photoshop for you. Yet, for the smaller size, because of the different aspect ratio, you'll necessarily have some loss. You can try to sharpen it after scaling, too. Just place some TOAW map on a lower layer and work on it with filters and manually, if necessary. There's only three tiles for dug-in positions. 1. Yes, it doesn't follow the same aspect ratio. You'll have to change it. Just scale to the 270x192 resolution. Yes, that's what I've been doing. Takes a bit more time having to unlock the AR and type the different res, especially when testing what works best when rescaling... oh well, no idea why they would've chosen to do this. Probably something left-over from the older games. Yes, I would guess PS probably has more options, and higher quality, given it's a paid product and used by the pros. Apparently, the last two replaced the old Sinc/Lanczos I remember from older versions. Not sure if these new ones are better. LoHalo is supposed to be better for downscaling more than half, but I think Cubic seems to be better. Linear is maybe "nearest neighbor"? I think the game does some scaling as well, so probably it doesn't matter much when zoomed out anyway. Status: offline I suppose linear is bilinear and cubic is bicubic, in fact. They will use a 2x2 grid. Nearest neighbor doesn't calculate an intermediate color. It just duplicate or suppresses pixels. That's why it is sharp, but also why it results in a jaggy image. I think cubic should do it. Perhaps the cubic sharper algorithm in Photoshop does some extra work in increasing contrast. Status: offline So I've been tinkering a bit - and I think I've found something that works for me. Basically just stealing the fortified line graphics, with bunkers for 100% fortification. I think it looks really good, and a lot better than the defaults. Hopefully it will not lead to gameplay issues - I think 100% entrenchment is also 100% fortification, so there should be no difference combat-wise for the two. This is the file itself. Cabido, would you be able to see if PS does better work on the rescale to small and medium sizes than Gimp? I wouldn't think it matters much anyway, but would be nice to know. NOTE; I've attached the original as imgur changes the uploaded image. Status: offline Here you go. I didn't test it. See if it makes any difference. There is only one little aspect about your solution that can affect game play: the 100% entrenchment position can be reduced; players won't know what is fortified line and what is reducible entrenchment. Perhaps changing the color of bunkers a little could help. Status: offline Thanks for that Cabido - the new ones are a little bit sharper, but it's so subtle it's nearly impossible to tell unless examined in high zoom. I was thinking maybe I copy the ones from the original tiles_fortifiedline.png into the medium size one, in that way using the texture intended for the game. They are a bit more subtle than the ones that are resized so don't stand out so much. Yeah, might be an issue there. Although, I think when fortified line, it will have ONLY 100% FORT. But when entrenched by a unit it will be BOTH 100% FORT and 100% entrenchment... Not sure. Also for some weird reason the bunkers in the high-res one is darker than the ones in the medium size, so when sizing down they keep this colour. Might be good to separate from the fortified line tiles. Status: online Entrenchment % doesn't give any defensive benefit - unlike Fortified Line. Entrenchment % only impacts speed of digging in. Status: offline Thanks for the clarification Bob, I think the manual is not very clear on this point, and seems to use Entrenchment level and Fortification level interchangeably. It's kind of murky. I don't really think it will make much difference to this though, this is a personal mod and I will probably be the only one using it, so I will quickly understand if it doesn't work as intended. However it's ****ty quality and pretty much useless for TOAW4. Maybe someone has a higher quality one somewhere?